When it comes the time to remove a dead tree or dying tree it is always best to address the problem sooner than later. Postponing the decision will only make the issue a more costly and dangerous one. Tree removals require an experienced and skilled crew that can determine the safest and best way to take down the tree. When you call True Cut Tree Care for your free estimate, the estimator will give you a written quote that will specify the work that would be done in detail, the price, and will talk to you one on one about what methods would be used for the safest removal of the tree. The Bucket Truck we use also comes in handy when small-medium trees are too dead to climb. This makes for an easier and safer removal of the tree. It is smaller than a crane and easier to get into yards to reach the trees. Under certain circumstances it may be necessary for the tree to be removed using a crane. Depending on the position of the tree, the health of the tree and other possible factors this may be the safest method of tree removal. True Cut Tree Care is renowned for their expertise in hazardous removals. We only work with crane operators experienced with large tree work, and use every precaution to make the job go smoothly and bring each piece down with ease. There will be minimal, if any, damage to your lawn. Crane are mostly used for very large and/or very dangerous trees. During this process, typically the climber will be taken up to the top of the tree by the crane, tie himself to the tree to secure himself, then slowly rope chunks of the tree that he cuts with the chainsaw. The crane holds the chunk until it is completely removed from the tree and then slowly and carefully lowers it to a safe place on the ground where the crew takes it from there, to be chipped or loaded in the dump trailer. Many trees that need to be removed are done by climbing and roping down chunks of the tree safely. This is a very dangerous job which is why it is so important to hire the right company. 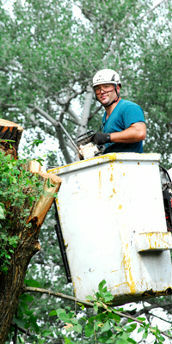 True Cut Tree Care’s climber and owner, Frank Bankowski, has the expertise to take on any tree removal. He is a second generation arborist, trained and certified with years of experience working with Asplund, and also with a company contracted by the California government working in the San Bernadino Mountains removing trees infected with a beetle that was killing large pines (This is also where Frank got his professional experience and training in crane removals as well). He started True Cut Tree Care in 1995. After the tree is taken down the logs are hauled away and the limbs and brush are chipped. You can choose to keep any wood for firewood if you’d like. The crew will then clean up any debris and if you choose to have the stump removed, our stump grinder can reach almost any stump with ease. The grindings decompose in the soil after some time, and you can grow grass, or even better yet – replant a tree!